The last week of weather across the US out into the central Atlantic has been rather busy. Earlier in the week, a low in the North Atlantic bottomed out at 934 mb and produced hurricane-force winds to 65-75 kt. OPC Surface Analysis from 1200 UTC on 02/20/19. Prior to the surface analysis above, ASCAT showed the hurricane-force winds in the west to southwest quadrants. ASCAT-A/B passes on 02/19/19 showing the hurricane force winds (red wind barbs near the surface low). Courtesy of the OPC social media group. That area of winds coincides with a strong stratospheric intrusion above 700 mb that wraps around the southwest and south quadrants. How do we know it’s stratospheric air? The ozone anomaly image from the NOAA Unique Combined Atmospheric Profiles (NUCAPS) shows the elevated ozone anomalies in the same general location as the strong winds. NUCAPS Ozone Anomaly around 1500 UTC on 02/20/19. Dark blue values indicate anomalies over 120% which indicates stratospheric air. ASCAT-A/B passes around 1500 UTC on 02/20/19. Later in the week, another well-forecasted hurricane-force low rapidly intensified farther south with peak ASCAT winds of 65-75 kt, though higher winds may have occurred prior to the occlusion between overpass times. The four day animation of the Air Mass RGB from GOES-16 (East) shows both storms with a strong signal for stratospheric drying (oranges/reds moving towards the center of each storm) which coincides with the strongest winds. Note how the second storm rounds the ridge after delivering wintry weather in the Mid-Atlantic and exhibits Shapiro-Keyser characteristics (note the system riding the northern edge of the baroclinic zone). GOES-16 Full Disk Air Mass RGB animation valid from 02/20/19 to 02/23/19. Unfortunately, we didn’t get an ozone overpass during the strongest winds. The OPC surface analysis below depicts a 959 mb low around the time of the ASCAT pass, yet the storm has continued to deepen today (02/24/19) to around 948 mb. OPC surface analysis from 1200 UTC on 02/23/19. The active pattern looks to continue into the next week, but farther west as blocking strengthens in the eastern Atlantic. The GOES-17 (now GOES-West) ABI has a cooling system issue that results in degraded image quality during certain times of the day. This anomaly was discovered last summer during post-launch testing, and steps have been taken since then (and continue) to optimize ABI performance. Additionally, CIMSS is working on data fusion techniques to further mitigate the effects (read here and here). Bands impacted: IR bands 8-12 (3 water vapor, cloud top phase, ozone) and bands 15-16 (Dirty and CO2 IR). This issue also affects the RGB’s, derived products, and channel differences that use the impacted channels. Time of year of impact: before and after the vernal and autumnal equinoxes. Time of day of impact: morning hours, ~0900 UTC – 1700 UTC. Greatest impact around 1300 UTC. Presently (mid Feb 2019), the degradation of the impacted GOES-17 bands has been apparent, and will continue to worsen through the end of February. Quality will improve in March, before worsening again in April. GOES-17 low-level (band 10) water vapor imagery from today, 15 Feb (0815 UTC – 1900 UTC) shows the imagery quality degrade, become unusable, and then improve during the overnight/morning hours (Fig 1). In this animation, there is about 4.5 hours (1115 UTC – 1545 UTC) when the imagery is unusable, and about 2 hours each before and after complete loss when the quality is degraded, but still usable. Band 10 (along with Ozone Band 12 and CO2 band 16) experiences the most degradation in image quality as a result of the cooling issue. Corresponding imagery from IR Window band 13 appears normal, as expected (Fig 2). Corresponding imagery from the Airmass RGB, which uses three of the channels impacted including band 10, of course shows degradation and loss similar to that of band 10 (Fig 3). Next, a 4-panel animation comparing the three water vapor channels (all impacted) and the 10.3 um IR channel (not impacted, Fig 4). Finally, a 24-hr full disk loop (starting 0230 UTC) showing all 16 GOES-17 ABI channels on 15 Feb 2019 (Fig 5). Not bands 1-7 (VIS, near-IR, shortwave IR) and 13-14 (clean IR window) and have no degradation. It was announced today (11 Feb) that GOES-17 will become the operational GOES-West satellite tomorrow (12 Feb) at 1800 UTC. GOES-15 (previous GOES-West) will continue to operate from the 128W position through early July 2019. The GOES-17 GOES-West position is 137.2W. Figure 1 shows GOES-17 Full Disk (15-min) water vapor imagery from today. 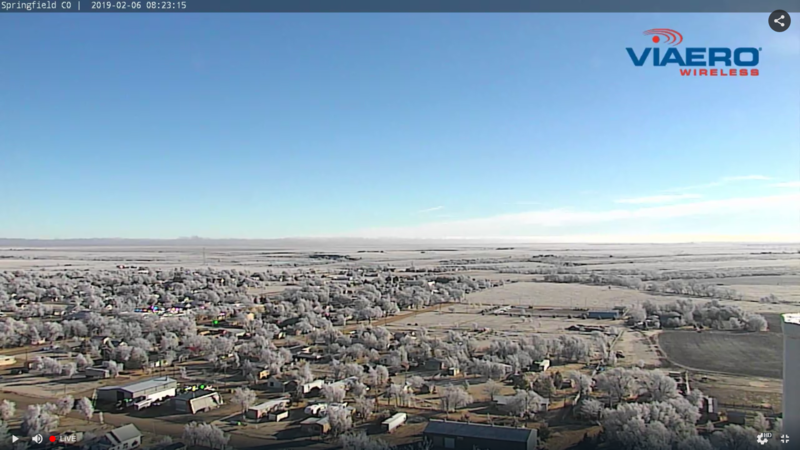 Freezing dense fog developed across the far eastern Colorado plains and surrounding states during the early morning hours of 6 Feb 2018. By mid morning, the dense fog began to lift and retreat east, revealing hoar frost had been deposited on surfaces. The hoar frost was first apparent to NWS PUB forecasters in the GOES-16 Day Cloud Phase Distinction RGB, where dark green colors appeared along the outside edge of the retreating low clouds (Fig 1). This dark green color comes from a relatively high reflectance (compared to bare surface, but not as high as with fresh snow) in the VIS, combined with warm temperatures in the IR, and low reflectance in the snow ice band. All of these details indicate a blanket of ice crystals on the surface. Analyzing the snow ice single-band imagery, it further appears that there was indeed a layer of ice left behind by the retreating fog, as ice crystals have a very low reflectance (Fig 2). In the channel 2 VIS, the frost layer is subtly apparent as slightly higher reflectance compared to the bare surface, but slightly lower reflectance compared to the low clouds (Fig 3). In all examples, the frost is seen quickly retreating/melting as the low cloud shield also retreats, exposing the frost to the sun. 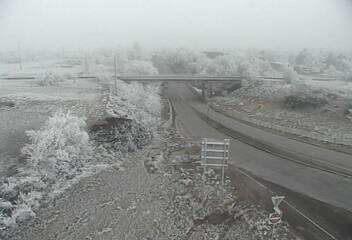 Finally, webcams in the area confirm the thick layer of hoar frost (Fig 4 and 5).